Tests have shown that the better we feel the more concentrated, friendly and agreeable we are and the better we perform. Employers can do a great deal to facilitate employees’ workplace comfort by providing good infrastructures, pleasant physical surroundings and an amiable indoor climate, etc. A relative humidity of 40-60% is optimal for offices, employee health, the environment and for a business’ bottom line. And it makes the temperature feel one to two degrees Celsius higher than it actually is. Moreover, it significantly contributes to environment protection by mitigating carbon footprint and cutting heating costs. However, if the air is dry, eyes begin to burn, lungs experience difficulty obtaining sufficient oxygen from the air they breathe and concentration begins to lapse. In addition, the mucous membranes become dry and the cilia slow down their sweeping, cleansing activity, allowing germs to become established. With the heating of cold air, relative humidity diminishes, making the air too dry for people, animals, plants and hygroscopic materials, such as paper, leather, wood, etc. Humidifiers balance and maintain the air’s humidity at a healthy, comfortable level. Nordmann Engineering’s humidifiers integrate into your air conditioning system or operate separately, if desired. Quick recovery from sickness or surgery is possible only under the right conditions. Humidity plays a key role in providing the necessary conditions. In patient rooms, sufficient humidity is essential to optimum respiratory system function. 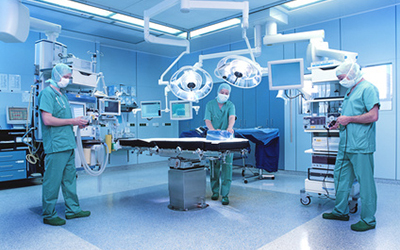 And in operating rooms (OR), the right level of air humidity is not just healthy, it is vital to the life of the patient, enabling highly sensitive medical equipment to perform reliably while preventing gaseous anaesthetics from igniting. Humidification involves the input of air, conditioned with water vapour, into rooms. Such air is sterile, providing reliable protection against the growth of microorganisms, and occurrence of odours. Constant temperature and relative humidity create an optimum environment and are necessary for monitoring device accuracy and the speedy healing of wounds. In addition, maintaining a proper level of humidity prevents dust from becoming airborne, and steam kills microorganisms. However, only a correctly dimensioned humidification system with application-specific design and build can deliver such performance. Whether the mass production of microcomputers, silk fabrics or thumbtacks, consistent quality is possible only with constantly uniform manufacturing conditions. This applies not only to manufacture in difficult climates, but it is also applicable in moderate zones. For success, manufacturers need the ability to control precisely both the temperature and the relative humidity in their operations. Nordmann is the ideal partner when it comes to compact and user-friendly OEM cabinet or full-system humidifiers. 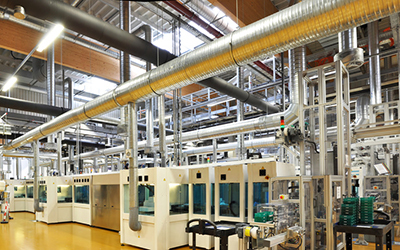 Industrial laboratories often require the ability to adjust relative humidity to exact specifications rapidly and reliably. Cleanrooms require constant humidity to ensure manufacturing conditions for highly sensitive products are consistently present and to prevent electrostatic build-up and discharge. Many materials used in manufacturing need a specific humidity to maintain their qualities and permit the desired processing performance. Dry air facilitates electrostatic build-up and electrostatically charged objects attract dust. Static electricity can damage electronic components. Steam humidifiers operate using microprocessors that permit reliable humidity control in cleanroom environments. Whenever servers, data storage components or printers are in operation, temperature rises quickly, which is why air conditioners are usually standard equipment in data processing equipment rooms. But cautious companies do even more to protect their data. They install humidifying equipment to keep air humidity at an optimum level. The equipment also applies a thin coat of moisture over all surfaces, improving conductivity. This prevents the build-up of electrostatic energy that would otherwise discharge regularly, disabling or damaging equipment. Microprocessor-controlled humidifying of machine and computer areas reduces electrostatic build-up and hazards. Many materials are very sensitive to rapid changes in relative humidity and react by shrinking or the loss of their elasticity. Valuable, older books are an example of this. If air humidity is too low, the pages become brittle and irreparable damage may result. Highly valued, antique furniture and wooden music instruments may warp or crack. For the sure preservation of valuable antiquities and art, books and other objects, the precise regulation and maintenance of relative humidity is of absolute necessity in museums. Nordmann delivers solutions designed to furnish humidification for consistent relative humidity that ensures property will retain its value for years to come. In many houses built today, there’s no need to open windows. Mechanical ventilation makes sure the right amount of conditioned fresh air is always present in the building. However, when the interior and exterior temperatures diverge greatly, the interior relative humidity decreases sharply and inhabitants experience the interior climate as too dry. Humidification converts the interior into a healthy-feeling space where people, pets and plants feel at home and flooring, furniture, art, books and music instruments retain their beauty and function longer. Steam humidifiers from Nordmann create the ideal interior climate, furnishing the perfect relative humidity for the specifically required conditions. Ambient temperature and relative humidity determine how comfortable we feel in an environment. Standards usually define the comfort zone as having temperatures between 20-60° C and relative humidity of 30-65%. When the relative humidity is within the optimum range, temperatures seem to be 1 to 2° higher than they actually are. Air humidification thus reduces heating needs and thereby costs. But air humidification can do even more. It prevents dust from becoming airborne and helps your mucous membranes retain their ability to ward off germs and bacteria that cause illness.